Small Island Economies (SIEs) are Small Island Developing States (SIDS), which share similar economic peculiarities and challenges. They are found in Africa, the Caribbean and in the Pacific regions. Their geographic location may make some of them more prone than others to specific occurrences, such as piracy problems peculiar to the Indian Ocean, or narcotrafficking in the Caribbean Sea/ Atlantic Ocean, but with respect to the economic and social impacts of these problems, they are considerably disproportionate compared to other developing countries. Small Island Economies suffer from limited diversification opportunities due to few natural resources that they possess and which can be harnessed for export. They all have maritime borders though which most of their imports takes place. However, the relatively small amounts imported and high freight costs become cost drivers in those countries. They are also characterized by high import bills of raw or primary materials for production and suffer from diseconomies of scale. The SIEs’ openness to and high dependence on international trade make the facilitation of trade a necessity as up to one-third of SIEs’ national revenues can come from it (compared to only about one-fourth coming from other taxes such as income). Effective customs administration (CA), as one component of trade facilitation (TF), therefore, should be a priority in small island economies. However, reality points to the fact that trade facilitation and CA face distinctive challenges that, when combined, lead to dire consequences in terms of revenue loss and characteristic under-performance in trade. Many ACP SIEs have joined global efforts to facilitate trade and to ensure the efficiency and efficacy of doing business within and at their borders. A number of them have implemented an automated system for customs data (Asycuda) system, except in the Pacific where it is not yet fully widespread. There is general need for an upgrade of software to higher performing technology to be able to implement more effective software such as Asycuda World / Asycuda World ++. In the Caribbean, to ensure that all are on board, the approach taken is regional. Some have established the customs electronic data interchange (EDI) system, which, inter alia, allows for the electronic processing of customs declarations. Many ACP SIEs are also targeting the establishment of the Electronic Single window Systems (automation of back-office single entry point for all actions related to trade). Many have embarked on conducting legislative reviews with the aim of developing an enabling environment for trade facilitation. With respect to international agreements that have the effect of facilitating trade, most Caribbean countries have notified their adhesion to the WTO Trade Facilitation Agreement and are taking steps towards the implementation of the work plan. Most Indian Ocean SIEs have also ratified the Agreement. Many Pacific WTO Members are yet to do so. Other such international arrangements such as the Revised Kyoto Convention (Convention on the Simplification and Harmonization of Customs Data) receive little participation from SIEs and so do not tailor their support to the specific trade facilitation and customs administration challenges of SIEs. At a recent World Customs Organisation (WCO) session of its Permanent Technical Committee, in November 2018, some of the challenges faced by customs administrations in small island economies were brought to the fore, with the aim of identifying means of supporting the integration of these economies into global value chains. The EU-funded ACP-managed TradeComII Programme Management Facility (PMU), which provides trade-related technical assistance to ACP countries, also analysed the needs of ACP countries with respect to trade facilitation and customs administration, as follows. Across the small island economies, the challenges of customs administration and trade facilitation are numerous and need to be highlighted in order to allow for adequate and targeted responses. The endogenous challenges are probably those that each country could resolve the quickest because of the ‘controllable’ nature of the issues at hand. The emphasis is not placed on the ease with which the control can be exercised, but it implies that their resolution depends on internal aspects that can be mitigated or controlled up to a certain degree for better customs management and increased economic benefit. Some endogenous challenges are mainly human-related and range from efficiency to technological uptake. Inefficiencies in timing (clearance and inspection) and reduction of costs of trade at the border (documentary compliance, border compliance, domestic transport) are often patent. The state of infrastructure often reveals non-trade-readiness for they require considerable modernization. Analysis of many ACP SIEs reveal that infrastructure at the air and sea ports are ill-adapted to their trade needs and provide limited options, not least of which is the lack of storage space. Infrastructure is often the first challenge faced by customs authorities after the passage of contrary weather systems as they are extremely vulnerable to annual weather damage such as hurricanes, cyclones, tropical storms, etc. This is closely related to transport issues especially inland, which often are in doubtful state before being further weakened by devastating weather events. The reliability of electricity is not always ensured and in general, there is low quality of internet connections and bandwidth. Internet connection is an essential piece of the technology puzzle and certainly is the main ingredient to help bridge the digital divide between developed and developing countries. The digitalization of trade may seem like an exogenous factor, outside of the SIEs remit to control, however the inability of the SIE to keep up with technological change reveals endogenous handicaps: the increased data flows and the rapidity of these exchanges make it imperative for SIEs to have strong performing broadband connections and electronic capacities. This requires also intellectual capital that is often lacking or limited. Further, insufficient financial means, but also low levels of throughput lead to the chronic lack of relevant technological goods to facilitate trade. Port / transport monopolies are present in a number of SIEs’ economic fabric, a vestige from colonial and immediate post-colonial times. These are sometimes averse to changes in procedures and are prone to establishing their own (high or disproportionate) transaction costs at the ports. There is the old management culture which focuses inadequately as a priority on the requirement of customs to collect the largest proportion of government’s annual, budgeted revenue rather than achieving equitable collection in tandem with the facilitation of trade for economic growth. Related to restrictive management culture averse to change, is the political focus of government priorities that does not prioritize effective CA or TF and limited human resources available in the public service. Risk management and intelligence principles and practices should be nurtured within customs administrations for better focus of resources on critical areas of need. Limited finances should help focus energies on requisite capacity building and eking out a true balance between trade facilitation and security issues. Commercial fraud in itself is not peculiar to SIEs but can be encouraged by the over-dependence on tax revenues of some government’s annual budgetary income. Under valuation, misdescription and non-declaration of excess commercial products coming through customs is a means of gross underpayment of customs revenues in SIEs. SIEs therefore prefer pre-clearance rather than a post-clearance culture, though the latter has proven to garner more revenue for the government coffers than the former, and has achieved reasonable levels of revenue recovery and higher levels of protection. 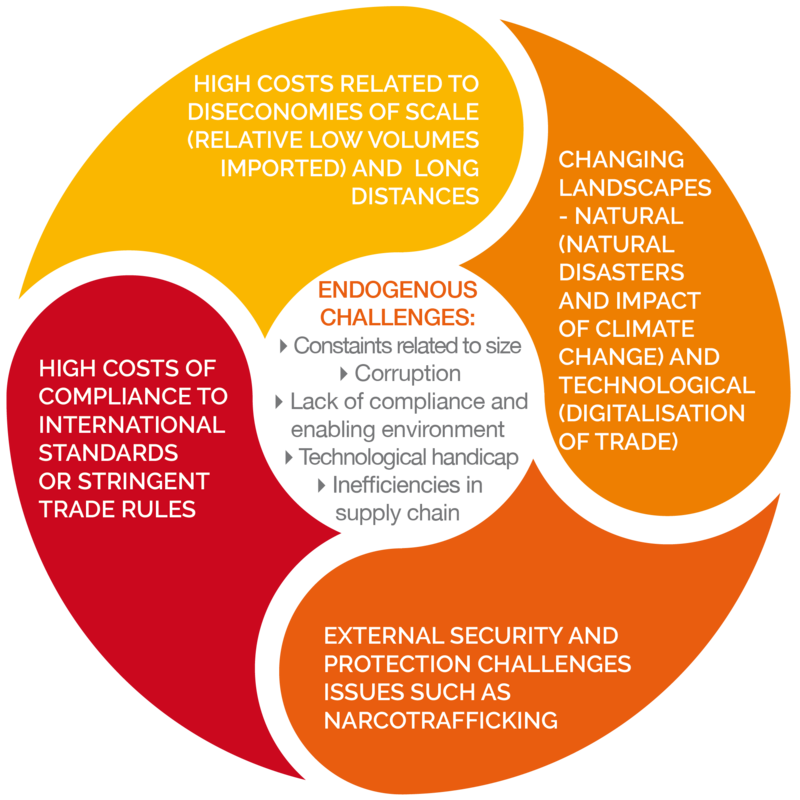 Other endogenous challenges are linked to the inherent characteristics of SIEs, related to their limited amount of natural resources, in some cases, remoteness, and limited economic diversification opportunities. These often imply the need to export raw materials at low prices, and import manufactured products at very high prices, in fact contributing to trade imbalances. In some cases such as in Mauritius, they import the raw materials for transformation, contributing to high import bills. Exogenous challenges specific to small island economies, specifically of concern to the Caribbean and the Pacific can be maritime, related to an increase in air transport and also climate-related. The increase of narcotrafficking in the Caribbean and in the Pacific has caused serious socio-economic damage to the fabric of island economies as traffickers furrow well-worn maritime transshipment routes between South and Central America and North America or as they venture into the deeper seas of the South Pacific towards Australia. This has added an extra layer of vigilance requirements by customs administrations because of its security challenge. Though this is necessary it can sometimes work against the ease of doing business in SIEs and weigh down trade procedures rather than facilitate such, for customs procedures and authorities become more stringent because of the fear of contraband and drugs. Natural events such as hurricanes, cyclones, high winds and other climate-related events place these islands in a climatic war zone that is detrimental to their economic progress. Often after the passage of wet weather events, these island economies are forced to take giant leaps backwards in terms of economic reconstruction, where once again the focus is on revenue-building and not efficiency. With respect to international support, SIEs are wary of receiving donor support that is not tailored to their needs and specificities. They often get sidelined because there are not poor enough to be aided, but not rich enough to go it alone. International regulations and standards can also be a serious impediment through the stringency of standards that are set, as well as the plethora of private standards that are being developed, coupled with high certification and quality requirements. These pose serious hurdles to trade for these very open economies as they often represent high barriers to trade for small exporters who make up the bulk of traders in SIEs (micro and small and medium enterprises - MSMEs). Certification requirements and procedures also come with challenges (though many have turned to the development of electronic certifications of origin). For smaller traders, who do not frequently export large quantities, the registration and application processes are still too cumbersome because of the requirements to repeat applications annually. These are essential to facilitate trade in a harmonized manner ensuring security for importers and consumers in importing markets. However, international standards are often capital- (intellectually and financially) intensive requirements and SIEs find themselves lagging in terms of their implementation and safeguarding their own interests. Another area of challenge for SIEs requiring heavy capital investment is the setting up of laboratories and other testing facilities. In many APC SIEs, the legal framework to facilitate trade is sometimes obsolete, and in need of revamping, redrafting and updating. Infrastructure support is essential, but that depends on the focus of specific donors. EU investment facilities and the European Investment Bank have specific programmes that may be tapped into. 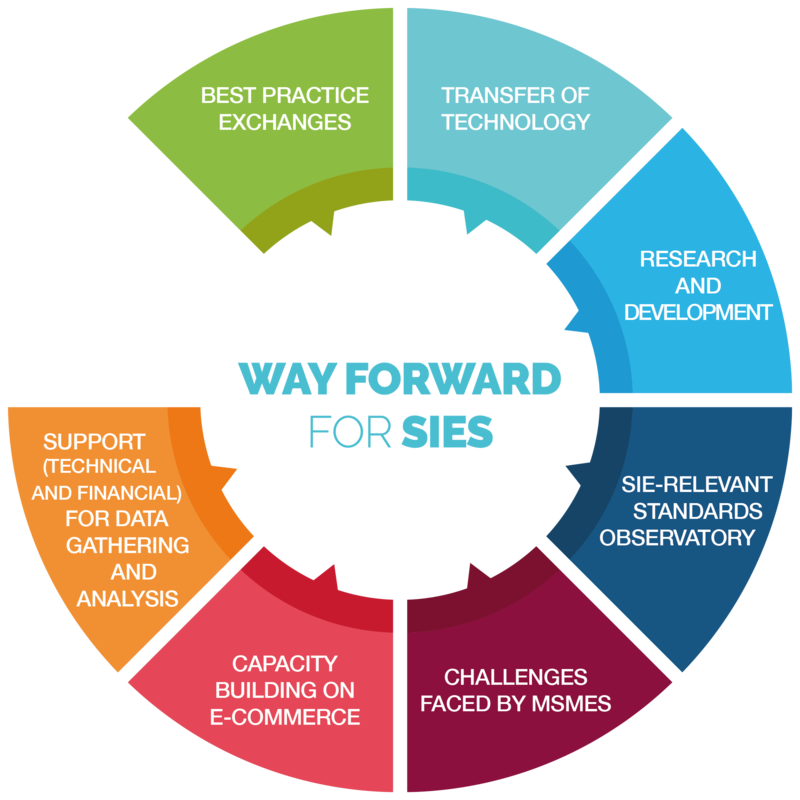 E-Commerce is essential for SIEs as it would boost their connectivity to global markets and value chains, but faces the double challenge of regulation and cybersecurity. Ecommerce could be a substitute for Mode 3 (Services-physical presence). It must be noted that trade facilitation requirements in the digital era will be time-sensitive and certification-sensitive. SIEs will need support to remain connected. SIEs are major exporters of services. But discussion on trade facilitation in services is relatively new. Informal discussions on services trade facilitation and analysis of cross-border flows of services could begin among interested SIEs (though this is not yet regulated at the WTO, and despite the absence of adequate international legal and regulatory frameworks for the management of entry and competition of service providers). It must be noted that many States are not ready to standardize services, so this may be an obstacle. And infrastructure quality may also be a major hamper to services competitiveness in many SIEs. 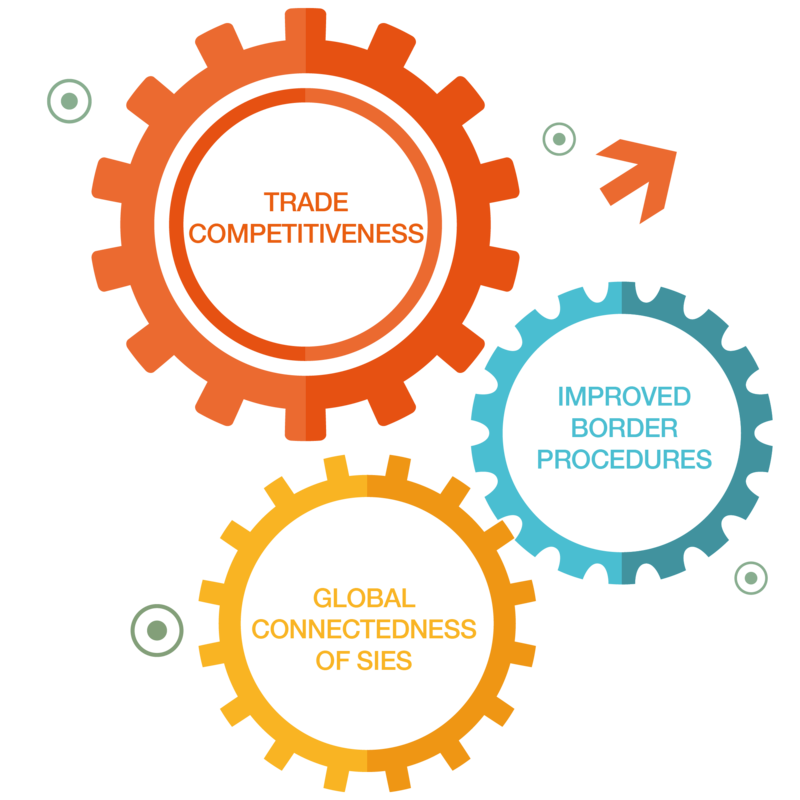 Regional integration for better trade facilitation - a viable opportunity? A Simplified Trade Regime (STR) is related to rules of origin, and it foresees simplification of procedures: eg. Simplified certificate of origin to be used in trade, along with harmonized (and for micro and small enterprises, a simplified) customs declaration. The STR addresses simplifying trade for small scale business across specific borders or specific types of goods could be covered such as ethnic or artisanal goods. future support includes: quality infrastructure and technical specifications and the regional organisation of standards; support for the ratification of the WTO TFA and the development of certification schemes to improve product competitiveness. future support includes: quality infrastructure for the region building on the experience of other ACP SIE regions’ experience; customs procedures & HS 2017 transposition; agro-processed exports and related trade facilitation requirements. Every effort must be made to prevent SIEs from falling through the cracks. Provide support (technical and financial) for data gathering and analysis.